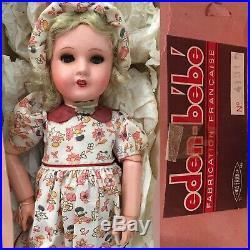 Here is a very rare late-period "Eden Bebe" doll, made in France circa 1940s. 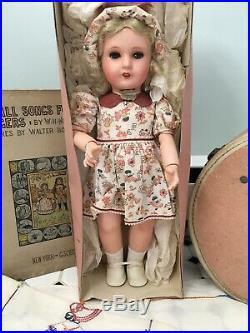 This 15 doll is all original and amazingly has never been removed from her box; she's still tied in. 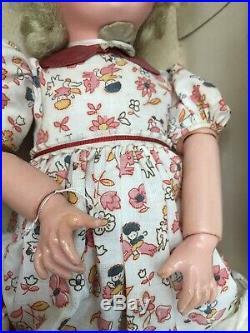 She is composition with fully jointed arms and wrists. Very beautiful face with brown sleep eyes and red lips, parted to show her teeth. Her novelty print outfit is completely adorable, with an Art Deco motif of tiny folks riding ducks and horses. 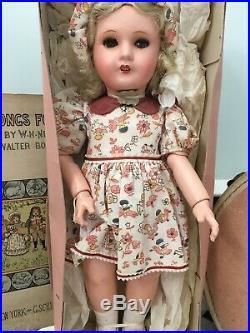 Box and doll have some minor discoloration from years of storage (must have been in an attic). 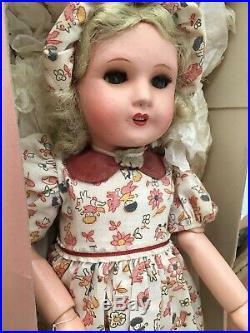 The worst flaw is a smattering of tiny pinholes around her right eyebrow. There is the faintest crazing beginning on her face, but it's not very apparent. Sleep eyes work but can be a little sticky. Overall she still looks wonderfully fresh! 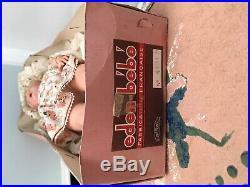 The item "Vtg RARE Eden Bebe 15 1940s SFBJ Paris France Jointed All Original with Box NIB" is in sale since Sunday, March 31, 2019. 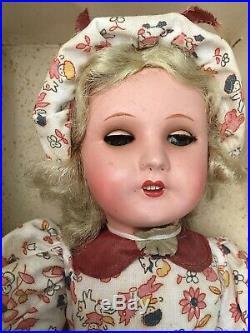 This item is in the category "Dolls & Bears\Dolls\Antique (Pre-1930)\Composition". The seller is "oatmeal_dog" and is located in Brattleboro, Vermont. This item can be shipped to United States, Canada, United Kingdom, Denmark, Romania, Slovakia, Bulgaria, Czech republic, Finland, Hungary, Latvia, Lithuania, Malta, Estonia, Australia, Greece, Portugal, Cyprus, Slovenia, Japan, China, Sweden, South Korea, Indonesia, Taiwan, Thailand, Belgium, France, Hong Kong, Ireland, Netherlands, Poland, Spain, Italy, Germany, Austria, Bahamas, Israel, Mexico, New Zealand, Singapore, Switzerland, Norway, Saudi arabia, Ukraine, United arab emirates, Qatar, Kuwait, Bahrain, Croatia, Malaysia, Chile, Colombia, Costa rica, Dominican republic, Panama, Trinidad and tobago, Guatemala, El salvador, Honduras, Jamaica, Antigua and barbuda, Aruba, Belize, Dominica, Grenada, Saint kitts and nevis, Saint lucia, Montserrat, Turks and caicos islands, Barbados, Bangladesh, Bermuda, Brunei darussalam, Bolivia, Egypt, French guiana, Guernsey, Gibraltar, Guadeloupe, Iceland, Jersey, Jordan, Cambodia, Cayman islands, Liechtenstein, Sri lanka, Luxembourg, Monaco, Macao, Martinique, Maldives, Nicaragua, Oman, Pakistan, Paraguay, Reunion, Uruguay.